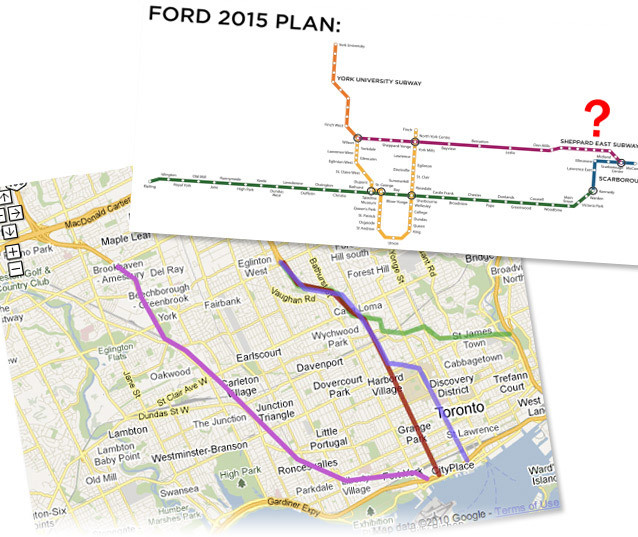 Rob Ford’s transit plan as interpreted by George Smitherman, and Rocco Rossi’s tunnel as interpreted by Patrick Cain. Fantasy transit planning 101. The deadline for candidate registration passed last Friday—dashing hopes for a white knight candidate—and not much changed. The five leading contenders who have been treading the campaign trail for months are still running the mayor-a-thon. This week can be defined by one word: debate. Candidates performed in a non-stop series of debates that were remarkably repetitive given the diverse list of sponsoring organizations. This scheduling frenzy has turned into a rhetorical arms race that is diluting the quality of all of the campaigns, and must be simply exhausting for the candidates. It’s like watching too many sitcom reruns: Smitherman snaps, Ford gaffes, and we get some mild entertainment value out of the predictable clash of personalities. September 12: The Iranian Canadian Congress hosts an afternoon debate at the North York Civic Centre. The Greater Toronto Business Alliance sponsors an evening debate moderated by John Tory and televised on OMNI. September 13: Building, Industry and Land Development (BILD) hosts a morning debate covering public housing, transit, infrastructure and financing. Ward 18 hosts an evening debate; Smitherman chooses to hold a rally at Burnamthorpe Collegiate instead. September 14: The Canadian Italian Business and Profession Association hosts an afternoon debate which runs longer than the candidates had all planned for, causing them to be late to an evening debate hosted by Equity Toronto at the University of Toronto’s Innis Town Hall. Candidates do not face off at this second debate, instead sitting down for a one-on-one chat with the ever-present John Tory. Ford declines to attend, burnishing his anti-downtown image. September 16: Building Owners and Managers Association (BOMA) Debate, followed by a Variety Village Debate on disability rights. September 17: afternoon debate at the Design Exchange building. And what was the upshot of all this to-ing and fro-ing and talking at one another? Many of the candidates talked more detailed policy this week, though in their haste to out-do each other, some have started to treat Toronto like a personal theme park. (Or maybe they just miss Mammoliti’s oddball ideas.) Against the backdrop of Ford’s pledge to ditch streetcars and Smitherman’s property tax freeze, Rossi jumped into the fantasy fray and proposed his now infamous “tunnel vision”. Over in reality, Smitherman promised that contractors would compensate businesses for delays in road repair. Thomson also fired up her policy machine, announcing a program to keep city councillors accountable and a comprehensive but ambitious bike plan. Rossi proposed repairing Toronto’s bridges using new, off-site replacement technology. Pantalone played the critic, sitting back and shooting down other candidates’ proposals. Back to Rossi, who lost a few marbles this week. He proposed a “Toronto Good Ideas Foundation” (check out the acronym) that would award prizes to citizens who submit good ideas to Toronto’s “suggestion box.” Our first suggestion: don’t model your policies after a grade three classroom. People are worried (with good reason) about this recent spate of wacky policy ideas. Candidates should have a better sense of the city by now. Thomson, perhaps desperate for some approval, claimed via Twitter to be “leading in a Globe and Mail poll.” Turns out, she was the most popular floating head in the over-hyped “Mayor Munch” online game. Rossi’s campaign is making robocalls to Torontonians, and then thanking them for complaining via Twitter. And just in case you thought Ford had run out people to offend, restaurant owners in the Beach are accusing him of libel. As if we all expected this to happen, Rob Ford’s campaign continues without blinking. Finally, Ford, Smitherman, and Thomson have decided not to disclose their campaign donors until after the election. Which is totally legal, although not in keeping with recent precedent—in the past couple of elections, the major contenders released their lists before the vote. Pantalone and Ford have said that they’ll be disclosing their lists prior to election day. It seems that maybe support is growing for Smitherman as the least offensive option. Faced with a non-compelling list of candidates and the spectre of Rob Ford, both unionists and prominent conservatives are backing Smitherman for the mayor’s seat. If you’re tired of the same old caricatures, check out some of the softer coverage of the candidates this week. Eye took a look at Rob Ford, the National Post met with Rocco Rossi, and George Smitherman sat down for some boy talk on the Dean Blundell show (102.1 The Edge). Meanwhile, Joe Pantalone displayed his dance moves at a successful “twist” world record attempt at Yonge-Dundas square. What we learned: Smitherman doesn’t know where his brother lives, Pantalone is adorably awkward, Rossi’s guilty pleasure is “cheese and bread,” and Ford is living in a fantasy world. (It is possible that we knew that last one already. And don’t forget: for more municipal election coverage from Torontoist, head on over here.